For those who depend on the use of a walker for their mobility each day, it can be hard to imagine life without the nifty invention at your side. But, your walker may be even more important than you realize. In a study of over 1,600 elderly individuals examining the results of exercise and mobility as opposed to a sedentary lifestyle, the exercise group was 28 percent less prone to becoming fully disabled. If you want to move around more and require enhanced functionality from yourwalker, we’ve selected some of our favorite trays and accessories to provide you with more independence while remaining safe with a walker. We love this tray for the adjustable spacers, excellent price, the variety of colors, and ease of use, removal, and cleaning. The Yunga Tart Walker Tray is ideal for holding a variety of items while you move around with your walker. This tray installs and comes off with ease. 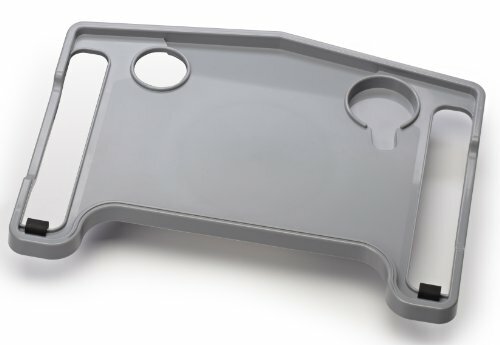 Thishis tray has one slot for a standard-sized mug and one cup holder, preventing the likelihood of users spilling drinks while maneuvering around with the walker. The compartment in the front is meant to help keep utensils from sliding around the surface. We also enjoyed the slight contour toward the inside of the tray. This divot allows you to get closer to the center of your walker, enhancing the safety and comfort of this walker. The raised edges also make this walker easier to clean. The ability to fold down this tray makes it an excellent choice for those who don’t want to remove the shelf every time they want it out of the way. 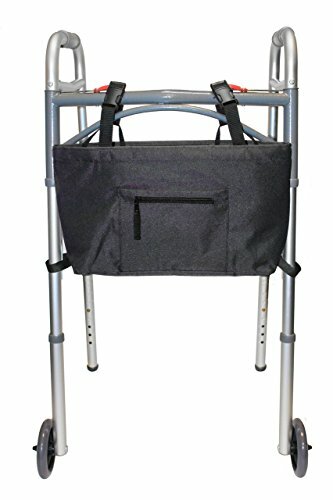 FITS MOST TWO BUTTON FOLDING WALKERS with 1" tube diameter and 18" width. See images and video. The NOVA Medical Products Tray for Folding Walkers is convenient because it doesn’t have to come off your walker every time you want the tray out of your way. We like the simple-to-install, clamp-on design of this tray. The anti-slip surface is has a lip-like barrier around its edges to keep liquids and other spills from falling onto the floor, preventing a slippery, dangerous environment for walking. We also enjoyed the two cup holder sizes with notches for mug handles. The tray is also very reasonably priced. Overall, this is an excellent folding tray with high customer ratings. We agree with the favorable reviews, as this is an exceptionalfolding tray. We love the universal fit and various uses for this walker tote. The RMS Water Resistant Tote Bag for Walkers and Scooters a suitable purchase for anyone looking for a carrying device for your walker and is not concerned about fit or don’t want a tray in your way. This adjustable, universal-fit tote (fitting most walkers and scooters) also happens to be water-resistant. It also has roomy interior storage with a secure Velcro closure. An additional zippered front pocket is a source of extra storage, as well. We love the low price almost as much as the multi-function carrying capability of this walker tote. This multi-purpose basket is fantastic for both its low cost and added convenience. 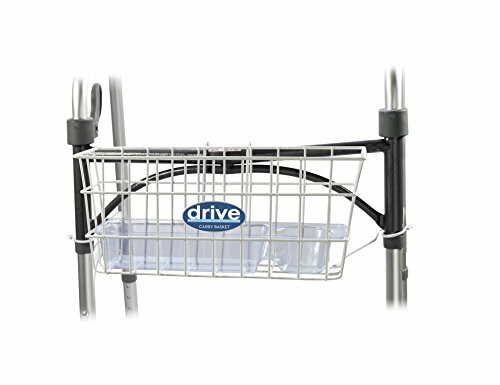 The Drive Medical Walker Basket is an perfect for those who want a carrying device for their walker but don’t want a tray or full tote bag. This white, wire basket has a cup holder and removable plastic tray if you don’t want anything falling through the wired-holes at the base of the tray. The basket is built to hold decent amount of weight, so long as you use caution and keep items balanced inside, as too much weight on one side can cause the walker to tilt. With the large wired openings, you can add a zip-tie or tie a couple of extra strings at the top if you’re worried about the basket staying put. We loved the exceptionally low price, most of all. The Able Life Bamboo Swivel TV Laptop Able Tray Table is a product with surprising utility, whether you use a walker or not. 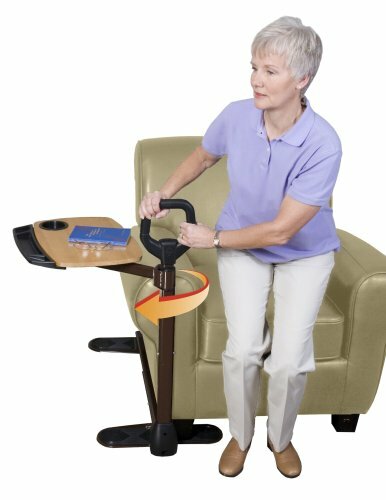 With a sturdy handle, it helps you sit or stand back up from your favorite chair or couch. We loved the swiveling tray that moves 360 degrees to push it out of the way or pull in front of you for tray use. This tray is adjustable in height and length. Likewise, the base and handle can be adjusted to give users a customized fit. A study from Oxford Academic found that 75 percent of people prescribed a walker or cane who fell at home were not utilizing their device at the time of their fall. The reasons given for non-use of their walker or cane included believing they did not need it, feeling old because of the device, and their given walker being inaccessible. It’s vital to keep your walker nearby at all times and, if required, have a device such as a cane or a sofa handle available, as well. Look for highly rated reviews in any product you buy online. There will always be at least some negative ratings, but if the vast majority are positive, you are most likely picking an excellent product. 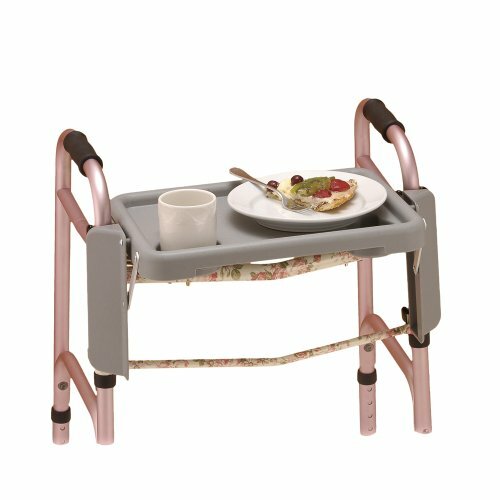 A tray should be sturdy, have a non-slip surface for items like plates, and attach to the size of your walker correctly. Some bariatric walkers will need universal-fit accessories or specially made trays. Make sure to measure your device to double check the size before you pick a tray or tote. Spills happen everywhere—tables, restaurants, in kitchens, and on patios—so, it’s inevitable that occasional spills will occur on your walker tray, if you ever use it for food and drinks. When these messes aren’t cleaned, they can attract pests such as ant and cockroaches. Not to mention it poses health risks to you to be in contact with surfaces that are never cleaned. Even if you don’t encounter a spill on your tray or in your walker basket or walker tote, germs will accumulate from coming in contact with your hands, objects like keys, books or magazines, tablets or e-readers that are touched all the time, and any other number of items that can transfer organisms from one place to another. If you have a standard tray, fold-down tray, or basket, occasionally cleaning with soap and water will remove residues and any dirt buildup. Part two is sanitizing once the soil is removed. You can use a disinfectant spray, a water and vinegar mixture, or disinfectant wipes to disinfect your walker tray or basket. For an item such as the water-resistant walker tote, it’s still important to occasionally clean it, especially during cold and flu season. A wash with a diluted mild detergent can clean your tote for you. If you’re concerned about it losing its water-resistance or would like more waterproofing, you can always consider a Scotchgard type of spray appropriate for clothing and upholstery fabrics to enhance its moisture resistance. Whenever using a walker tray or basket, first be sure to test out its weight capabilities and if it has any issues with balance. If you place too many objects on one side, for example, see if your walker becomes unsteady or starts to lean forward. Do this with the help of someone or while in a safe location where you will not fall with the walker if it does happen to topple over. Always follow the weight capacity limits labeled on your walker tray or bag. Sites such as Amazon usually offer plenty of questions and answers next to the reviews section if there is a specific item you’re curious about carrying. Some customers provide helpful answers to questions over whether a basket will handle bottles of a particular weight, if they can handle oxygen tanks of specific sizes, and even if a tote will hold toy-sized dogs. If you just cannot seem to find the answer in the information section, and no one has asked about your specific question, ask away! You can submit a query for any walker product, and usually helpful people will respond to the best of their knowledge or from their first-hand experience with the product. If you’re still not sure what you need for your walker, we recommend starting with the Yunga tray if it fits your device measurements, as it’s affordable and an excellent walker tray-top for basic use. With the variety of colors, you’re bound to find one you like.